In 2017, nearly 1.90 billion internet users will reside in Asia-Pacific—making up more than half of the world’s digital population. The audience will grow 8.0% this year, driven by mobile adoption. At least 70.1% of internet users in the region will use a smartphone. Internet penetration among the total population will be highest in markets with widespread internet coverage, like South Korea (87.8%), Taiwan (82.7%), Japan (82.3%) and Hong Kong (81.8%). Meanwhile, penetration rates will be low in countries that are building their mobile networks, such as India (33.5%) and Indonesia (38.7%). Smartphones will overtake feature phones as the primary type of phone used in Asia-Pacific this year. The user base will grow 11.8% to reach 51.0% of mobile phone users. By 2021, penetration will hit 62.4%, spurred by improving internet coverage and speeds as well as more affordable device options. The tablet user growth rate in Asia-Pacific will be just 4.6% this year, with user numbers totaling 520.9 million. Interest in tablets is low across the region, as consumers look to invest in new, larger smartphone models. China will have 771.9 million internet users this year, or 40.7% of the region’s digital audience. The number of users will expand 5.7%, driven by rural consumers going online for the first time via smartphones. 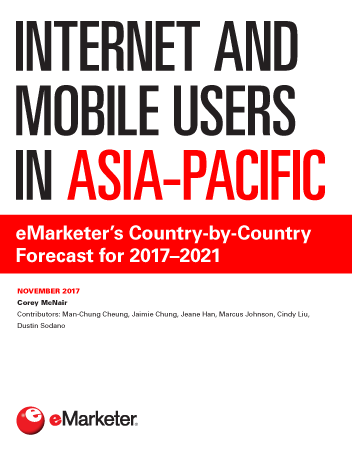 "There will be 1.33 billion smartphone users in Asia-Pacific this year, an 11.8% gain over 2016. By 2021, the number of users will approach 1.81 billion."